These simple pants could not have a more apt name then the Men's Basic Medieval Pants. These pants feature something of a universal style, as they can be used, effectively and seamlessly, in virtually every form of medieval and renaissance style. These pants are handcrafted from 100% woven cotton fiber, which gives them a fairly nice balance between fabric weight and protection from the elements. Otherwise, these pants are very simple in appearance. They feature an elastic band around the waist that makes them highly adjustable and easy to wear. The legs are full-length and loose-fitted, ensuring that these pants are nothing if not comfortable. They are also available in multiple colors. 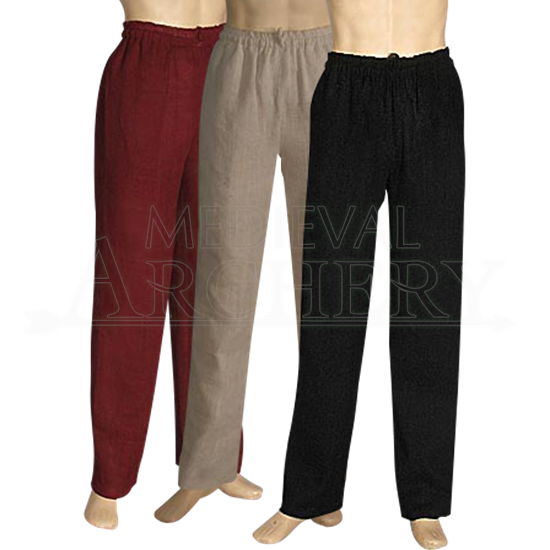 The Men's Basic Medieval Pants are a great choice to include in your medieval wardrobe, especially if you are just starting out. Never has one pair of pants had so many different uses.